The William Hill 2 Clear offer awards customers with a free bet to the value of 15% of their winnings when they back a winning horse that wins by 2 or more lengths in selected races. This offer can return a regular profit with minimal risk when finding good matches with low or no qualifying loss. The maximum free bet which can be claimed is £100 which means there is a lot of potential profit to be made with this offer being available daily. what is the william hill 2 clear offer? William Hill selects certain races each day for which the 2 Clear offer will be valid on The offer is also valid on all flat races shown live on ITV. When customers backs a horse that wins by 2 or more lengths on these races they will receive 15% on top of their regular winnings as a free bet. The selected meetings change each day and are available to view on the William Hill homepage. Making a profit from the William Hill 2 Clear offer is thankfully pretty simple. We'll be using the standard back and lay method which you will be used to if you have done any matched betting previously. It's worth noting that this offer is not risk-free but if you are able to find horses in the selected races which have good matches (where the back odds are very close or the same as the lay odds) then you should be able to return a good profit over time. The key to making a profit on this offer is to find very close matches. If you do this you will minimise qualifying losses for when the horse you back doesn't win or wins but by less than 2 lengths. First we need to find out what races the 2 Clear is valid on for the day. To do this we head on over to William Hill. You can see on the image above that today's selected meeting is Lingfield and so we now need to find a good match on a horse racing in one of the races. Using a standard odds matcher like you find on MatchedBets.com or OddsMonkey is simple enough and will display the best matches based on back and lay odds in order. Using the filter options in the odds matcher, we choose to display only matches from William Hill and for all races at Lingfield today. You can see from the screenshot above that there are many good matches. We're going to use the top one as an example which is 'Jungle Inthebungle' to win in the 14:55 at odds of 3.0 at William Hill and lay odds of 2.98 at Smarkets. You can also use a racing matcher to find good matches for this offer. Using a racing matcher has additional benefits as it will show you your qualifying loss for each match based on a specified stake. Below is a screenshot of the Racing Matcher from OddsMonkey. You'll see that it is only displaying results for the 14:55 at Lingfield and so there is no need to use any filter options as they are all integrated into the matcher. Note: You'll notice that the lay odds for 'Jungle Inthebungle' have changed slightly. This is because the race we are searching for is only an hour a way and so the odds fluctuate very often. The racing matcher shows us that if we back 'Jungle Inthebungle' at odds of 3.0 on William Hill and lay the horse on Betdaq at odds of 3.15, we will incur a qualifying loss of £1.52 based on a stake of £25. If you wish to place a higher stake you can edit the stake amount in the calculator which will update your qualifying loss. Now that we have found a match, we need to work out how much our lay stake will be based on our back stake. If you are using the racing matcher it will display your required lay stake based on a £25 back stake but if you are using an odds matcher or are placing a higher back stake then you will need to using a matched betting calculator. 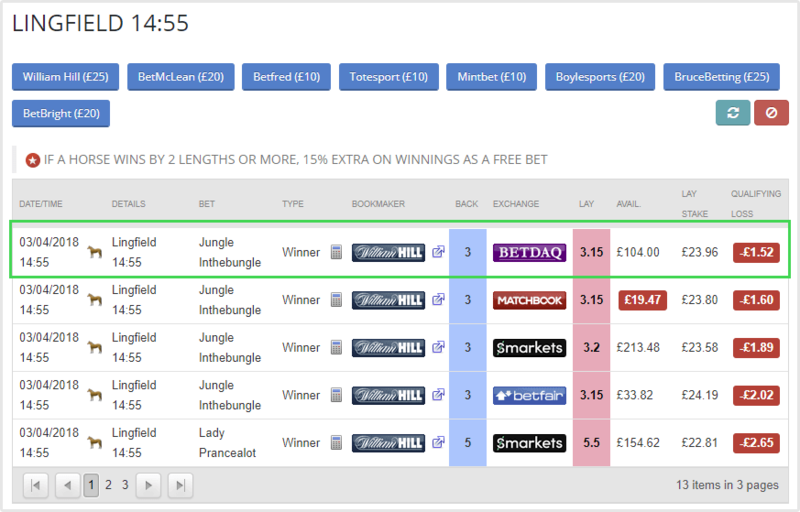 Using the odds we found in the odds matcher, the matched betting calculator shows us that if we placed a £10 bet on 'Jungle Inthebungle' at odds of 3.0, we need to place a £10.14 lay bet on Smarkets at odds of 2.98. By doing so, we will incur a qualifying loss of 6p or 8p depending on if the horse wins by 2 lengths or not. If our horse wins, we will have lost 8p but will have gained a 15% free bet based on the amount of our winnings. The free bet which is awarded when you back a horse that wins the race by 2 lengths or more is equal to 15% of your winnings. Using the example above, our winnings would be £20 (£30 back from William Hill minus our initial £10 stake). Therefore the free bet amount will be 15% of £20 which is £3. If you expect to extract around 80% from your free bet, this will give your free bet a £2.40 cash value. Take away the £0.08 qualifying loss and you are left with a £2.32 profit. This might not seem like a lot of profit for the effort but there are multiple eligible races each day and hitting a couple of winners will add to your matched betting profits. You can also increase your stake to receive a bigger free bet should your horse win by 2 or more lengths. The maximum free bet you can be awarded is £100 and so let's take a look at how to work out the stakes to receive the maximum free bet possible. Using the example above again, we would need to place a back bet of £333.33 in order to have the chance of receiving a £100 free bet. You can see from the calculator above that if we increase our back stake to £333.33, our lay stake increases to £337.83 with a liability of £668.90. Our qualifying loss has also increased to £2.25. In order to claim the maximum free bet, a large bank is needed either in your William Hill or betting exchange account and so it is only advisable for experienced matched bettors. If your horse wins by 2 lengths or more, William Hill will credit your account with a free bet. You can use this free bet on any sport and you have 4 days to use it before it expires. Extracting a cash value from your free bet is where you will make your profit. To do this, you simply use the back and lay method again on an event of your choice. Use an odds matcher to find a good match and use a calculator to calculate your lay stakes, remembering to select the 'free bet' option on the calculator. Back low-odds favourites - You want to hit as many winners as possible and so backing a favourite will increase your chances of doing so more often. The lower the odds on a horse, the more chance they have of winning the race by 2 lengths or more. It also helps if there is not much competition n the race. Find close matches - You won't back a horse that wins by 2 lengths or more in every race and so it is vital that you keep your qualifying losses to a minimum to increase your overall profit. Don't bet on every eligible race - If the only horse races that you bet on are 2 Clear races then it is a sign to William Hill that you are matched betting. If you take advantage of promotions too often, you increase your chances of being gubbed. The William Hill 2 Clear offer is a profitable offer which can be completed multiple times a day. If you have a large bank then there is the potential to make hundreds of pounds daily with this offer. However, we advise you not to overdo it with this offer and not to attempt to claim the maximum free bet amount each time in order to stay under the radar.